Two hundred years ago in May a Great Auk was killed at Fowl Craig on Papa Westray. 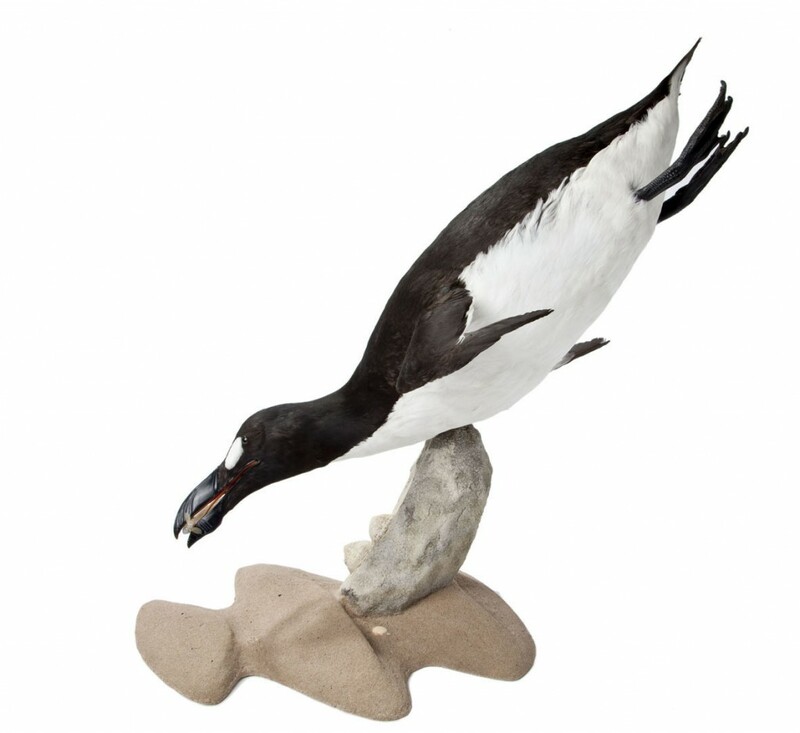 By this stage the Great Auk, a large flightless seabird of the North Atlantic closely related to the Razorbill, had been largely decimated at its main breeding colonies. It only survived in small numbers at sea, and depended on a few last remote islands for its short summer breeding season. Although Great Auks continued to cling on until the 1840s or perhaps later – the last known breeding pair was killed on the small Icelandic island of Eldey in 1844 – the Papa Westray auk is significant as it was one half of the last known breeding pair in Britain, and is the only remaining British Great Auk specimen. The bird’s extinction is symbolic, as its fate can be landed fairly and squarely on the actions of man, who drove the species to extinction by over-exploitation largely for its meat. The last remaining birds, including the Papay auk, were killed for collections. Two hundred years later, we might like to think that we are wiser than our forebears, yet today our actions are still directly leading to the extinction of species across the world, or plunging them to critically low numbers. The small Great Auk monument erected in 1988 at Fowl Craig by junior members of the Orkney Field Club is a sad reminder of the loss of an iconic species. Yet that auk statue itself has witnessed very significant losses of other birds during its 25 years. Kittiwakes especially used to circle and wail around the cliffs in multitude, yet these days you are lucky if you see even one. Arctic Terns nested in thousands on the maritime heath nearby, harried by Arctic Skuas, but nowadays the heath is, by comparison, eerily quiet. The Great Auk is a powerful iconic international symbol of warning against extinction, and conservationists and community groups aim to mark this poignant anniversary of Orkney’s last auks with a series of events that both celebrate the life of the Great Auk and foster a greater sense of conservation. The Great Auk has strong cultural value in Papa Westray, whilst the auk collected on Papay in 1813 is one of the long-term treasures of the British Natural History Museum. The Papay Community Association is thus organising a special Great Auk weekend from 17-19 May to mark this bicentenary in collaboration with the museum and other partners. 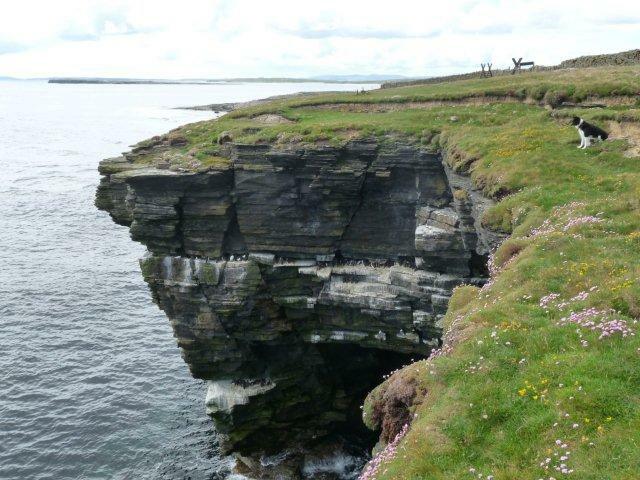 This will include the display of a 3D ‘virtual auk’ by Site-Eye Time-Lapse Films, presentations about the auk, including its life-history, its status in Orkney and in Orkney archaeology, an account of the collection of the last auks on Papa Westray and more recent events. The Great Auk weekend in Papay will also include a dinner, a concert and dance with Orkney band Hullion, a special Great Auk ‘farmers market’ and a community walk to Fowl Craig, where a film will be made during the week using time-lapse photography. This film and other presentations were also shown on the opening day of the 2013 Orkney International Science Festival. Collaborations through the year with the Papay school, artists and others created commemorative materials for display and local sale, reviving the memory of this lost magnificent bird and reminding us that once a species is gone, it really is gone. Tim Dodman is an international conservationist based on Papay. His main work is in wetlands conservation in Africa, where he has lived in Somalia, Zambia and Senegal, with missions in around 40 countries. He has published widely, and is a co-author of the Atlas of Wader Populations in Africa and Eurasia.